Since the beginning of the nineties, Lidó Rico has been developing one of the most regular. constant and personal bodies of work on the Spanish art scene; a body of work in which the eminent aesthetic, objectual and clearly sculptural quality of what is on exhibit is combined with a clear performance and gestural component. His works are the result of a violent process of gestation in which the artist, in a quasi-ritual act, submerges his body in plaster to create a hollow mould that will subsequently be filled with polyester resin.The fragmented bodies and dislocated faces that emerge from the wall as if t hey wished to free themselves of its tyranny thus constitute only half of what has taken place. The placing of the works on the walllikewise make one think of “another hidden side” from which the bodily parts break through as literally “desubjected” subjects.The idea is “not to show it all” and to leave a part hidden. In other words: to subvert tthe view of totality. A subversion that the creative process itself contributes to: the works do not give all there is, but rather invoke a previous time, a past, a process that the viewer becomes aware of. Moreover, in this respect, the work refers to a bodily poetry of the index and the contad that transforms Lidó’s works into bodily remains, leftovers and residues of existence. The contemplation ofthis work transports the viewer to the moment of producing the remnant, opening a temporary doorway between the past and the present that literally gives “body” to what is visible and places it in relation to the process of gestation and the phenome-nology of its making. For some time now, this referral to the universe of the past, this time warp which can be appreciated in Lidó’s work, has -if at all possible- become more complex.The presence of the process and t he index of the body that refer to the previous moment contrast with the ”ap-pearance” of the figures in space, precisely like a ghost, as an apparition. The bodies that come out of the wall are already, in themselves, apparitions, but this ghostly quality is emphasised even more in the works in which the artist uses fluorescent pigment, which must be seen in the dark. In this series of works, the figures are momentarily charged with light and appear in the dark just like ghosts; though ghosts which still maintain an essential bond with the fiesh. And this is what upsets the logic of the apparition, since ghosts are usually represented as bodiless beings, as immaterial images. Lidó’s works break with this logic and offer us material images that hide their body in the dark, but which finally end up revealing themselves. However, if one thinks about it, this play of light/dark is also a play or dialectic between materiality and immateriality.The figures appear as bodiless images, as mere lights in the dark; but then, when they are illuminated, they become material. This series of tensions especially perturbs the viewer because it not only manifests the confrontation between seeing and not seeing, but also between having and not having, between being a body and being an image. What Lidó Rico does is to invert the terms of showing. Bl ind-ing to see and lighting to stop seeing. lt constitutes an inversion of t he gaze; a way of upsetting the order of what is visible. When t he lights are off, the image appears, and when the lights are on, this image is revealed, showing itself in its material, bodily reality, as a remnant. The imma-teriality of the image is thus stained forever by the real materiality. the obscene vestige of the body. This radical presence that one can no longer fully get away from, no matter how often the lights go out, no matter how often we get rid of the bodies. This relationship between hiding and showing is to be found in the Fort/Da game, which Freud saw his grandson playing one day.The child held a wooden reel in his hand and then threw it under a sofa. When the reel disappeared, he said “fort” and his face became sad; then he pulled on the thread and made the reel reappear. exclaiming “da” with an expression of great satisfaction. 2 Freud saw here a metaphor of the moments of absence and presence of the mother: a being and a disappearing. What the child was doing was to repeat the fundamental trauma in accordance with which plenitude and stability are always just about to disappear. The game made the threat of loss evident and the need to inhabit that unstable place between presence and absence. 3 Somehow, this attitude can also be observed in Lidó Rico’s recent work: showing and hiding, revealing and concealing; but, above all, creating a bond between what is visible and what is invisible, between being present and being hidden.A bond that is, more exactly, a stain.The stain of absence that means that the possibility of loss is part and parcel of all presence. Deep inside it. every seeing hides a loss. The gaze is no more than a continuous process of loss. Loss and reencounter; though a reencounter always stained by the imminent possibility that everything may once more disappear. Lidó Rico’s entire work has been presided over by a reflection and an attempt to work on the individual subject, though always via the mask and stereotyped gestures.The expressive gestures that appear in his works are linked to performance and always maintain a certain dis-tance with respect to authenticity. This seems to be a constant in Lidó’s work, the tension be-tween two apparently contradictory elements: reality (that of the remnant and of contad w ith the body) and fiction (that of gesture and of pulling a face). A tension that is actually a friction, because the gesture is and is not, at one and the same time, what it represents. We are not deal-ing he re with the abstraction of Greek masks (based on ideal concepts) or the authenticity of Roman funerary masks either (which presented the individual subject). but which represent that which is social. Consequently, his body, his gestures would not only present a demand or an experience of the individual-which is where they originate from- but rather are extended to present a series of problems and issues that are developed on the social plane. 4 We thus find ourselves before a social body in the literal sense of the term. A body that does not deny its individual, subjective,localised condition, but which momentarily takes on forms and expressions that be-long to the exterior sphere. Perhaps the expression that would best define this is what Jacques Lacan called “extimacy”, that form of innerness or subjectivity that cannot be detached from a language and experience acquired outside of oneself 5 Lacan maintains there is no interior or exterior, but rather a way of continuous relation and construction between these two spheres. To a certain extent. Lidó’s art works in this way establishing communication -or rather a continuous tension and friction- between the experience of the subject –which is a bodily, gestural and physical experience- and the experience of the world fundamentally symbolic in nature, thus creating an art that produces symbols from what is concrete, that generalises the experience of the body at the same time as materialising the social experience, capturing in the individual body the entire extensive spectrum of problems, fears, desires, wor-ries and longings of a society such as ours. It is through this allusion to the double aspect of Lidó Rico’s praxis that we are able to comprehend the path his work has taken in recent year s, from an initial period in which individ-ual, non-transferable experience constituted a central poetics through to a series of more recent works in which the allusions to this social body to which we referred earlier are the ones that seem to gain increasing presence and force. This presence of the symbolic social body can be found, for instance, in the reference to the imaginary of terrorism, concealment or military con-flict, which takes on material form through the images of the masked face, weapons, the skull . .. signs that lead us directly to the presence of death, unease or terror. Terror and fear formulated in the abstract, since both the terrorist and the victim seem to be abstractions of our time for Lidó, ideas that are constantly in our heads and which configure our way of understanding and inhabiting the world. Ideas that are al so incorporated in the experience of the artist, as a con-temporary subject, and which are then materialised through the gestures and faces of the moulds. In the present exhibition, Curso legal [Legal Tender), Lidó Rico continues to work along this line of alluding to central issues and imaginaries that pose a threat and cause anguish in our time. On this occasion, the focus of reflection is the issue of money and the crisis, as well as the monetisation of bodies and the reduction of subjects to mere components of an abstrac-tion it is now impossible to imagine. As Vicente Verdú has pointed out, the economic crisis has generalised a catastrophic, funerary imaginary that has spread ubiquitously throughout our day-to-day lives.6 What he calls “funerary capitalism” would be a sensation of”the end of the world”, of an Apocalypse, which the crisis has produced. A sensation that has a substantial religious component. The crisis -and t his is one of the strong points in Verdú’s line of reasoning- has been seen and communicated by the mass media almost as if it were a divine punishment, as retribution for sinful behaviour that has inadequately employed available resources. A punishment for committed sins. Deep down, this idea of divine chastisement has a lot to do with the fact that the religious element has always underlain capitalism. Even Marx considered capitalism a religion. A religion which Walter Benjamín perceived as purely cultic, lacking theology or dogma. 7 A practica! religion, with a basic ritual, buying, which is constantly repeated, as every day is a holy day. In capitalism’s calendar, every day is devoted to worship and the temples are ubiquitous. What is truly strange about t his religion is t hat, instead of leading to redemption or the expiation of guilt , it is dest ined to reproduce it via a perpetul! state of debt. a pure abstraction, a purely immaterial sign that travels through cyberspace; but no-one knows where it is. Where to find those to blame for this situation? Where is the money? 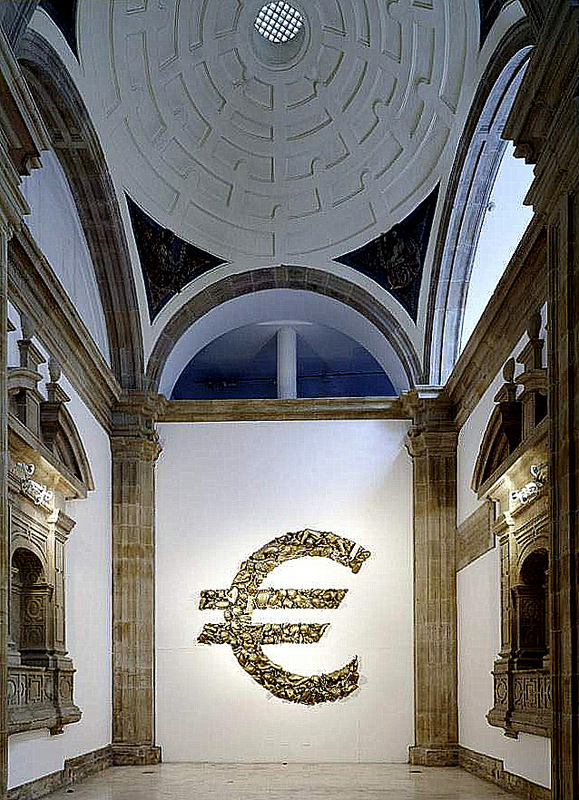 Lidó Rico seems to give an answer through a large Euro-shaped altarpiece, one of the most powerful works he has recently produced. Here the artist shows the links between money and what is held sacred, but above all he makes evident the idea t hat money is now incarnat e. that now, more than ever; the social body is the body of capital. The symbol, this pecuniary abstraction, has taken us over. It is no longer an exterior instance that we use when we need to, but rather one we have been inoculated with and which has transformed our chromosomes in exchange rates.Today when one pays w ith a credit card, what one is doing is affinming one’s identity. Symbolically. it is no longer an operation of loss, but one of affinmation of the power of paying:’ ‘whereas handing over cash effectively diminishes us, presenting a credit card (or credit itself) expands us nomi-nally”. 9 A card is a name. it is the credit -understood in a moral sense- we have in a society. becoming increasingly larger and more and more insuperable. Coins of legal tender and subjects that cannot be processed as such. Illegal subjects in a system that gives off an unbearable ubiquitous stench of rot. l . Cf Clement Rosset Fantasmagorías, Madrid, Abada. 2008. 2. Sigmund Freud, Más allá del principio del placer. Madrid, Alianza 1984.
de Cultura Económica • 2005. S. jacques Lacan, El Seminario. Libro VIl. La ética del psicoanálisis 1959- 1960, Buenos Aires. Paidós. 1988. 6.Vicente Verdú, El capitalismo funeral. La crisis o la Tercera Guerra Mundial. Barcelona. Anagrama 2009. 9.Vícente Verdú. Op. Gt p. 46.